Vendors at the Nashville Flea Market have been against a soccer stadium being built at The Fairgrounds Nashville. The flea market has been known as a place to find or sell something special. Vonna Beam has helped her husband sell his artwork and vintage toys. "He does his artwork and sells toys throughout the month, but this is the big time that he's able to make the largest amount of income," Beam said. Beam said Saturday is the best day for them. They use the money to pay their bills. "There's no guarantee that with the building of the stadium that it wouldn't interfere with the flea market and what we do here," Beam said. The city released these renderings of what a Major League Soccer stadium would look like at the fairgrounds. "Under the plan, the Flea Market vendors would have new and better facilities in which to operate. Before undergoing any demolition or construction, we will work with the Fairgrounds and Flea Market vendors to ensure minimal disruption to their operations and find suitable temporary accommodations. The addition of the soccer stadium and associated mixed-use development will be a positive step forward for long term operations. The largest expo events, excluding Flea Markets, use an estimated 1500 – 3000 parking spaces at any one time. Those large expo events usually are campus-wide and we would need to work with the team to coordinate schedules so that games and large expos would not occur on the same dates. For small to medium expos, yes, we believe the available parking would be more than sufficient." Earlier in November, Metro Council members approved financing for a $275 million Major League Soccer stadium at the Fairgrounds. Mayor Barry has promised plans include keeping all of the existing events at the fairgrounds in place. 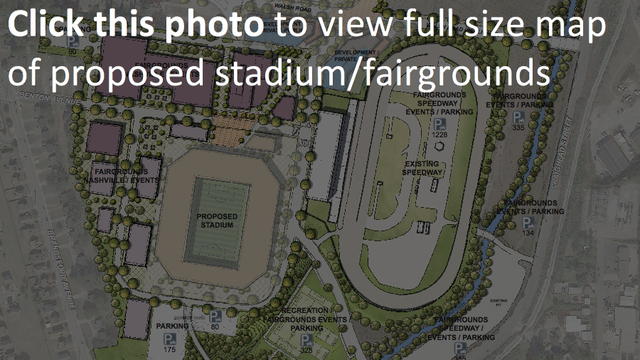 The Mayor's office sent us a photo to illustrate how fairground events would be separated from the proposed stadium. Over 2,000 vendors set up for the Flea Market on the last weekend of every month. Many of them said they're wondering why the stadium can't be in a different spot. "They been wanting to get rid of us here for several years," Frank Shoemake said. "Mayor Dean tried to get rid of us, it's politics in it. They're going to get rid of the flea market." Shoemake, a seller of children's books, continued, "I've been coming here about 30 years, and a lot of the people here, they're like family." He's concerned that moving expo buildings and stadium construction could keep customers from coming here. "We'd just like to stay where we are," Shoemake said. "If they put the soccer team here and can still work us in the same weekend, it will be no problem, but they won't guarantee that." It's hard for vendors to see how they could share the fairgrounds. "It's all about money," Shoemake said. "It might bring in more revenue, I don't know. Like somebody said a long time ago, we've got the best politicians money can buy." So now they're anxiously waiting to see if Nashville will get the MLS bid in December. "It's their livelihood," Shoemake said. "They got nowhere else to go."